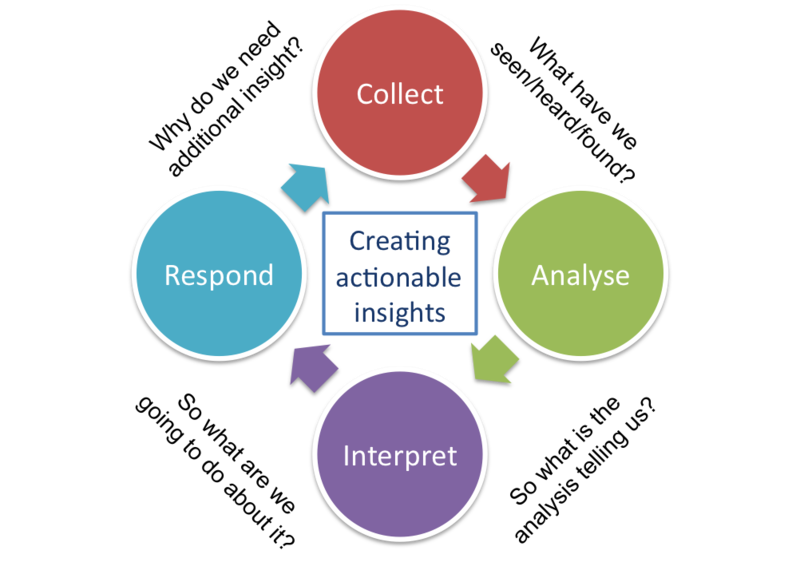 Creating actionable insight is the cornerstone of being a customer-centric organisation. And in principle is sounds quite simple – find something insightful within your data and then take action based on what you found. Easy! Maybe not… recent research by IPSOS MORI for Verint suggests that while nearly all organisations collect some form of customer-related feedback or insight, most are not leveraging this feedback strategically. Those that are doing something with it seem to be focusing on using it to measure their people/processes rather than to improve customer experiences. Some aren’t even doing that much, including many sports organisations. The reason for this is starting the process with the wrong question. Too often the starting questions are “what data can we easily get” or “what do we already measure”? As a result, its very hard to then find insightful “so what” answers that can inform relevant action. Instead the starting question needs to be “why do we need the insight” or “what will we to do with the answers”? Knowing what the insight work needs to answer, and how it will be used, provides direction to the work. It defines what data needs to be captured and from who, and it also identifies who will be responsible for acting on the answers. Collect – source, gather and aggregate raw data about your current or potential customers – who they are and what they are saying, thinking, feeling and doing about your sport. To achieve growth you will need to be capturing both current behaviours (what/how/when) and the influences & motivations driving those behaviours (why). Analyse – crunch the data to find trends, patterns and potential relevance across the different data sources. Interpret – review the analysis in the context of your organisation/customers/market, to understand what’s happening and why it may be of significance to you. This “so what” step is what turns data into insight, yet its the one often missed out or rushed. However without being clear about the “so what”, organisations cannot then respond successfully. Respond – take timely action in response to what the insight is telling you. This response can be both internal – improving plans, processes, delivery etc – and/or external – improving the offer to customers or just letting them know you were listening. Starting in the wrong place – projects are being scoped based on what data can be captured, rather than what insights are required. By not asking why the insight is required, the data subsequently captured might be interesting but doesn’t help drive action and growth. Losing control – the “so what’ interpretation is being completely outsourced along with the data collection, rather than benefiting from the expertise of people across the organisation. As a result it’s much harder to identify “so what does this mean for us”, and misses the opportunity to engage the organisation in creating customer-centric responses. Missing in action – the outputs of the “insight work” appear in presentations and newsletters, but don’t subsequently spark any considered action. This maybe because the “so what” is missing, or because the staff aren’t engaged with the work or because the reports weren’t created with actions in mind. Given these challenges, why bother? Simply put, the opportunities for creating and acting upon improved insights are huge (as are the risks of doing nothing). Sport has a massive opportunity to drive sustainable growth through an improved understanding of how to add more value to current and potential participants. And this improved understanding will improve the focus and effectiveness of delivery, which means this growth can come with an improved return on investment. Thanks to Michiel Lely and Roula Andari at Verint for prompting this post, with their presentation and subsequent discussion at the Directors Club breakfast. Seth Godin has made an interesting post about a consumers underlying fear of being wrong, and how they behave as a result of it. His final sentence, that this is “the lone barrier almost every product and service has to overcome in order to succeed” is particularly relevant for the sports industry. In developing, packaging and promoting participation opportunities, sports need to be considering (which means they first need to be asking) how current and potential customers feel about their sport. And the good news is that some sports are already creating some good practice for addressing these fears. Back to Netball helps overcome the fear of no longer having the right skills, as participants can all be rusty together. Likewise the different group speeds available within RunEngland Networks and SkyRide Local’s help people get over the fear of not having the initial fitness to keep up. But until sports fully understand how current and potential customers feel about their sport (and the same person may have different perceptions/experiences, and hence fears, about different sports), they won’t be able to talk to potential participants in a way that addresses these fears. And until then, they’ll never know what they were missing! What’s your team’s/club’s/sport’s Net Promoter Score? Or put another way, how many of your current customers would actively refer you to their friends? While debate rages about how accurately this measure can predict revenue growth, most leading companies still pay more attention to this measure than they do to customer satisfaction scores. Why? Because we’ve all claimed to be satisfied when a waiter asks for our feedback on an ordinary meal. But rarely have we then recommended that restaurant to our friends. Net Promoter Score was in the London news this week, in an article about Metro Bank. If you’ve not heard of them, they’ve just opened their sixth branch in London and are owned by Vernon Hill. According to the article, Metro Bank have a Net Promoter Score of 97% – that means 97% of their existing customers would recommend them to a friend. Now they’re still very young, but that’s still a remarkable number. For context, the reported score for First Direct (who have a strong history of growth through word of mouth) was 57%, for RBS was 10% and for Barclays was -35%. In Barclays’ case, that means 35% of its clients would actively dissuade a friend from using it. From a sports perspective, it’s easy to think that all our regular participants would recommend us to their friends. After all, they must love the club/sport if they keep doing it. But if that were the case, every team and leisure centre would be experiencing astronomic growth! So what would you need to do, to have 97% of your current customers wanting to recommend your team or sport to a friend..? There are many elements to delivering a great customer experience. And Cadbury seem to have tripped over one at the same time as they’ve succeeded with another. Cadbury’s recent TV ads have won them many accolades, tweets, posts and comments. The gorrilla feeling the air has nearly 4 million YouTube views, and the eyebrows already have more. I’m sure the word of mouth from these ads has even driven a few extra sales for Cadbury and Phil Collins. But all is not smooth and milky in Bourville. Cadbury have apparently downsized their Dairy Milk bar to 200g, and customers have rebelled like angry gorrillas. And in the same way that customers can spread the good news about a fun advert, they also have powerful ways of sharing their displeasure. A chocloate lovers action group has sprung up, with a website and twitter account. There’s also a YouTube video, comparing the packaging and showing the reaction of some consumers. In years gone by, such rumblings may have soon disappeared. But the mainstream media has picked up on it now too, with a story on Campbell Live and a story in the National Business Review by Hazel Phillips. This in turn has inspired one of Cadbury’s local competitors, Whittaker’s, to get on the front foot and create a comparative advert. Cadbury’s say that they prefer to focus on the ‘fun & enjoyment’ of chocolate, but it goes to show that customer engagement comes from delivering a consistent customer experience across all customer touchpoints.